Michelson A.A. The relative Motion of the Earth and the Ether. 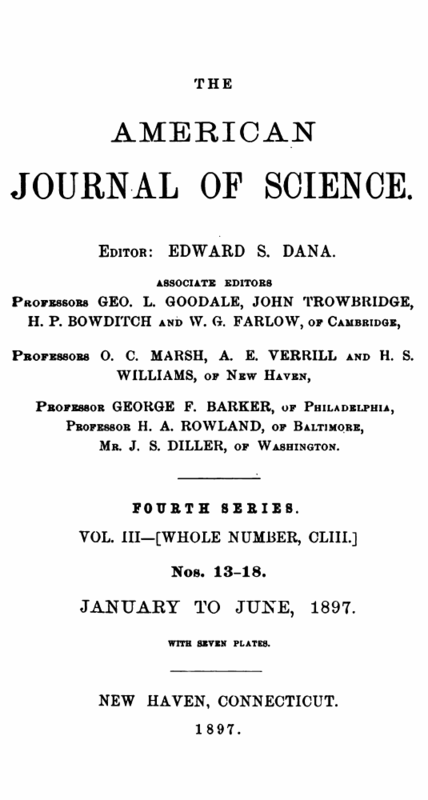 // American Journal of Science.—Fourth Series, Vol. III, No. 18.—June, 1897. Mr. J. S. DILLER, of Washington. Art. LI.—The relative Motion of the Earth and the Ether; by Albert A. Michelson. To account for the phenomenon of aberration Fresnel supposes the luminiferous ether at rest, the earth moving through this medium without communicating any perceptible part of its motion. On this theory it has been shown* that it should be possible to detect a difference of the velocity of light in two directions at right angles. As no such difference was observed, it would seem to follow that Fresnel’s hypothesis is incorrect. 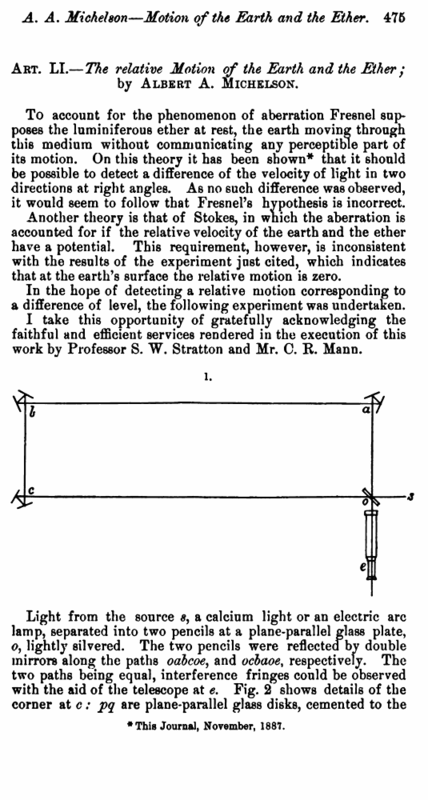 Another theory is that of Stokes, in which the aberration is accounted for if the relative velocity of the earth and the ether have a potential. This requirement, however, is inconsistent with the results of the experiment just cited, which indicates that at the earth’s surface the relative motion is zero. In the hope of detecting a relative motion corresponding to a difference of level, the following experiment was undertaken. I take this opportunity of gratefully acknowledging the faithful and efficient services rendered in the execution of this work by Professor S. W. Stratton and Mr. C. R. Mann.